Robert Willis, age 89, of Aurora, passed away Thursday, December 14, 2017, Memorial Community Care in Aurora. A Memorial Service will be held at 11:00 A.M., Tuesday, December 19th at the Aurora United Methodist Church in Aurora. Rev. Karla Sheffy will officiate. Inurnment will be in the Aurora Cemetery at a later date. Visitation will be from 5-7 P.M. Monday at the Aurora United Methodist Church, 1104 A Street. Memorials may be made to the family to be designated at a later date. Condolences may be e-mailed to the family through the mortuary website at www.higbymortuary.com. 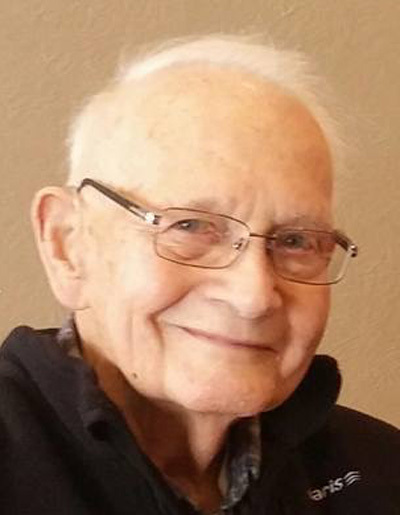 Robert Hamilton Willis, the son of Ralph and Hilma (Anderson) Willis, was born at, Aurora, Nebraska on December 30, 1927 and passed away in Aurora, Nebraska on December 14, 2017, at the age of 89. He grew up in Aurora and graduated from Aurora High School in 1946. Bob was a 3 sport letterman and Captain of his football team. Following his graduation, Bob served his country in the U.S. Army during WWII in Japan during the War Crime Trials. He was honorably discharged in December of 1947 and when he returned Bob attended Tech School at Milford. Bob was united in marriage to Genene Griffith on October 15, 1950 at the Evangelical United Brethren Church and they remained in Aurora to raise their 4 children. Bob worked for the Postal Service for 40 years in a variety of capacities. At the time of his 1988 retirement, Bob was serving as the Aurora Postmaster. Bob started a second career with Willis General Contracting, his son Jim's business, where he touched the lives of many young men until retiring a second time. Bob was an active community volunteer serving 15 years as Boy Scout Master, 53 years on the "ChainGang" at Aurora High School, 23 years with Lions Club, Lifetime member of American Legion, Flag folder for color guard for many years, 15 years alongside his wife Genene with Volunteers in Mission where they built homes in Mexico, and a 30 year member of National Association of Federal Employees. Bob’s hobbies included stamp and coin collecting, woodworking, AHS and NE sports fan, fishing and hanging out at the family cabin. Those left to cherish his memory are his wife, Genene Willis of Aurora; four children, Jim (Deb) Willlis of Aurora, Sandi (Jeff) Geier of Lincoln, Jerry (Sheryl) Willis of Kearney and Steve (Audrey) Willis of Lincoln; 9 grandchildren, Skyler Willis, Molly Willis, Cole Willis, Hunter Willis, Sara Willis, Matthew Geier, Jonathan Geier, Andrew Willis, Katelyn Willis and a great-grandchild: Nevaeh Miller-Willis. He is also survived by three sisters Darlene (Bob) Russell, Lois (Ron) Burns, Alice (Gordon) Johnson, and two brothers, Ted Swanson and Terry (Pat) Willis.